The crystal giant has produced a very small quantity of items specifically with a smoker in mind: the Swarovski Ashtray, the Swarovski Cigarette Lighter, and last but not least the Swarovski Cigarette Holder. While there were 5 crystal ashtrays, and 3 crystal cigarette lighters, there were basically 2 crystal cigarette holders: a solid crystal one, and one with various metal accents. The most common Swarovski Cigarette Holder is 100% crystal with no metal accents. Known by the Swarovski part number 7463 062 000, this piece was designed by Max Schreck, and produced 1981 to 1990. With a height of about 2.25″, it was designed to hold unused cigarettes. The other, far more unique and hard to find Swarovski Cigarette Holder was produced 1977 to 1983 with a variety of metal accents: Swarovski Polished Rhodium Cigarette Holder (shiney silver), Swarovski Brushed Rhodium Cigarette Holder (brushed silver), and Swarovski Polished Gold Cigarette Holder (shiney gold). This item stands about 5 1/2″ tall and is documented by the Swarovski part number 7503 050 000 regardless of the metal trim. A Swarovski Polished Rhodium Cigarette Holder was recently available on ebay. Last week, it failed to get an opening bid of $79. A few days later, it was relisted at a fixed price of $115, and sold in < 12 hours. Swarovski Cigarette Holder figurines can be found at Crystal Exchange America in the “Useful Swarovski” , “More Functional” sub-category. Using and cleaning cigarette holders, they are more likely to become damaged than if they were only displayed in cabinets. If you plan to actually “use” them, I would not recommend paying top dollar to ensure it is in MINT condition or that it includes original box and coa certificate/paperwork. Swarovski collectors can appreciate when the crystal giant makes products that are not only beautiful, but also useful (if you are a serious collector, you probably wont “use” something that is functional). Cigarette Smokers may be interested in the Swarovski Cigarette Lighter, as well as the Swarovski Crystal Ashtray products that have been available through the years. The oldest Swarovski Ashtray figurines were like small bowls with a rim of polished silver or polished gold which included an extension to hold a cigarette. These units are known as the Rhodium Polished Ashtray and Gold Polished Ashtray. These Swarovski Ashtrays used the part number 7501 061 000 and system number 011 157. These figurines were the smallest of the ashtrays made, measuring about 2″ in diameter. The ashtrays feature the old Swarovski logo since they were produced 1977 to 1983. The more commonly seen Swarovski Ashtray is solid crystal and is nearly 4″ in diameter. The identification numbers for this smoker’s accessory are 7461 100 000 and 010 061. Max Schreck was the Swarovski designer of this ashtray, which was available from 1981 to 1990. In the late 1980’s and into the mid 1990’s, Swarovski produced some limited edition Swarovski Ashtrays, identifiable by their unique names: Posacenere and Cendrier. The Swarovski Posacenere Ashtray (Posacenere is the Italian word for ashtray). Being a part of the Daniel Swarovski line, this ashtray features Ettore Sottass signature along with an identifying serial number. While the Swarovski Posacenere was limited to 500 units, it was available 1989 to 2001….quite a long time to sell 500 units. Perhaps this was due to the sticker price of $1720???? Lastly is the Swarovski Cendrier Ashtray (Cendrier is the French word for ashtray). The Swarovski Cendrier was limited to 2182 pieces and sold 1992 to 1995. It was designed by Martin Szekely and sold for $190 during its 4 year production run. Swarovski Ashtrays can be found at Crystal Exchange America in the “Useful Swarovski” category, “Ashtrays and Treasure Boxes” subcategory as well as the online auctions. If you plan to actually “use” a Swarovski Crystal Ashtray, I would not suggest paying extra money to ensure it is in MINT condition or that it includes original box/paperwork. Using and cleaning ashtrays, they are far more likely to get damaged than if they were display only units. 2012 is the 25th anniversary of the Swarovski Crystal Society (better known as the Swarovski SCS). According to the crystal brand, there are over 300,000 members in their exclusive Swarovski club. Swarovski is commemorating the event with some special figurines, including the Swarovski Jubilee Dragon. Kristall Buzz is going to join in on the celebration featuring articles on the Swarovski Annual Editions over the next couple of months. Swarovski Lovebirds are the feature crystal figure of this article. The Swarovski Lovebirds were available for purchase only in 1987 for collectors who were members in the Swarovski SCS. At that time, SCS was an acronym for Swarovski Collectors Society. The Swarovski SCS was begun in 1987 only in the English-speaking countries: USA, Canada, Australia, Great Britain, and South Africa. As a result, the distribution channel for the Togetherness Lovebirds was much more limited than it is today. 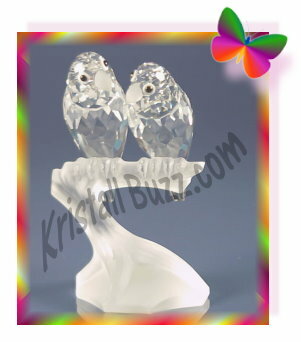 The Swarovski Togetherness Lovebirds stands just over 4” tall. It is a figurine with 2 clear birds, somewhat looking at each other. They have frosted beaks and are perched on a frosted branch. Following the release of the Swarovski Lovebirds, two Swarovski designers were given credit for this beautiful design: Adi Stocker and Max Schreck. ‘Togetherness’ is the only figurine designed by 2 Swarovski artists. For about 10 years, either designer was permitted to sign the crystal figurine (at designer signing events). But in 1998, Swarovski decided to give full credit of the Togetherness design to Max Schreck and Adi Stocker was no longer permitted to sign it. The SCS Lovebirds does contain what the crystal brand calls the ‘backstamp / bottomstamp’, which is included for the sake of authenticity. Looking closely at the underside of the frosted base, the designer’s initials “MS” and the year “87” can be seen. The Lovebirds were known using the Swarovski part number DO1X861, and years later the system number 013 560 was revealed, so it can be identified using either number. The Swarovski Lovebirds is one of three crystal figurines in the Swarovski Caring and Sharing trilogy. Other Swarovski Lovebird designs include the Swarovski Baby Lovebirds, which were produced 1996 – 2011. A special thanks to Jane Warner, co-author to Warner’s Blue Ribbon Books on Swarovski for consulting on the Swarovski Lovebirds article. The SCS Swarovski Lovebirds retailed for $150 USD in 1987. The purchase price included the crystal figurine, a custom box for the figurine, and a Swarovski COA (certificate of authenticity). While the resale price of the Swarovski Lovebirds spiked to over $4000 shortly after 2000, a mint condition figurine, complete with original packaging can generally be purchased on the secondary market for $2300 – $2700, from Swarovski expert dealers, like Crystal Exchange America.